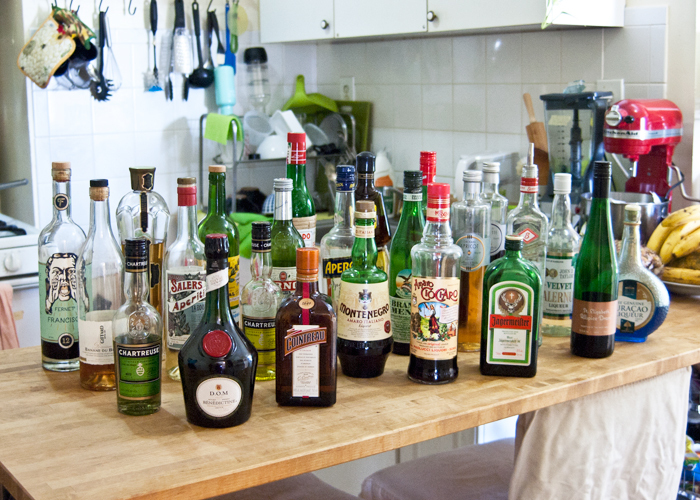 Today is National Liqueur Day, so I figured I’d just feature all the Liqueurs I have at the moment! 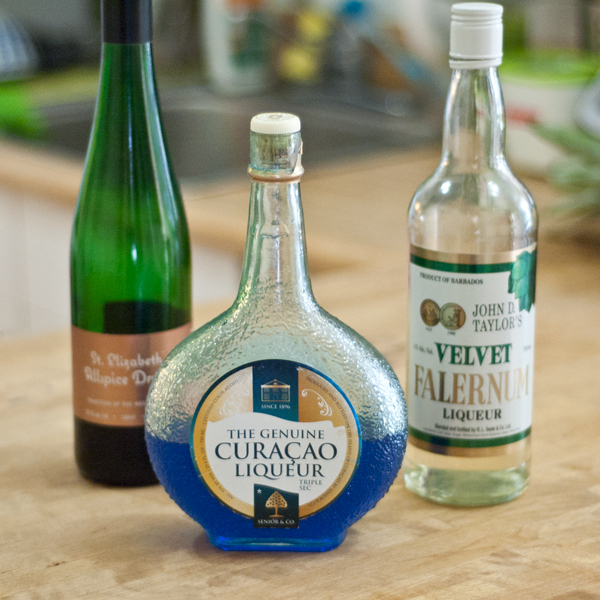 When I set the bottles up on the table, I had a flashback to many great and glorious drinks I’ve made with these Liqueurs. You see, the key to being a good Home Bar Gurrrrl/Dude, is to have good ingredients. If you have good ingredients they will speak to you and tell you what they want to do in your drinks. The easiest way I could think of to categorize these Liqueurs was by region, so we’ll admire them in their appropriate groups. 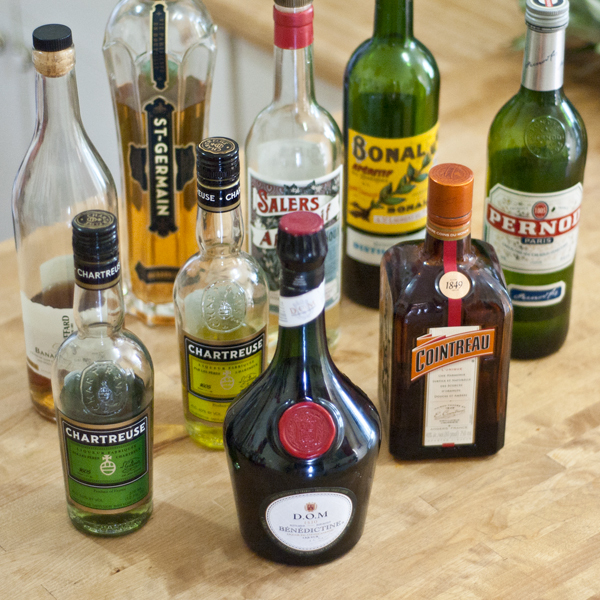 France: I’ve always got the Chartreuse sisters, Cointreau, Pernod, and St-Germain on hand. I’ve only recently acquired Bénédictine, and am terribly excited to use it with Whiskey, Cognac, and Gin. Giffard Banane, is of course excellent in anything it touches. I tend to use Salers & Bonal in the same way that I would Italian Amari, though French Apéritifs tend to be lighter and have more gentian/cinchona bark flavour. Italy: Luxardo Maraschino Liqueur is an absolute staple for classic cocktails. Must have. Frangelico provides a wonderfully nutty flavor that goes very well with Rum, Whiskey and Cognac. You may know Aperol from the Aperol Spritz and because it is a very drinkable bitter Liqueur. 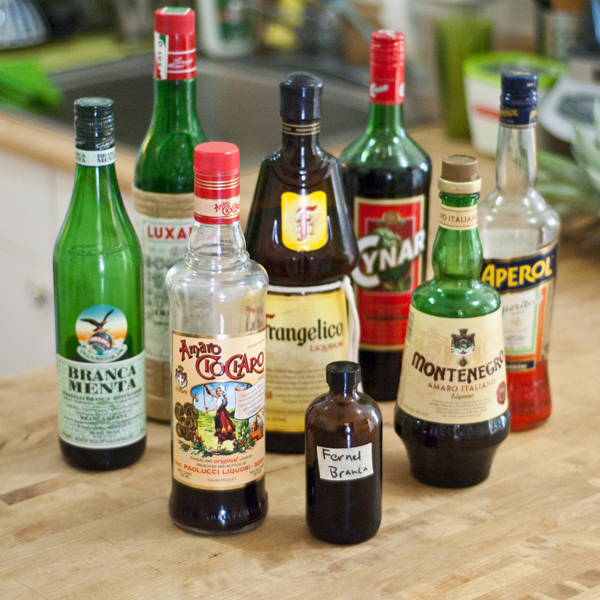 And then there’s the great Italian category of Amaro, aka Bitter Herbal Liqueurs. I have have at least five Amari on hand at all times, because the variances between them may seem small to the untrained palate, but make a world of difference in cocktails. 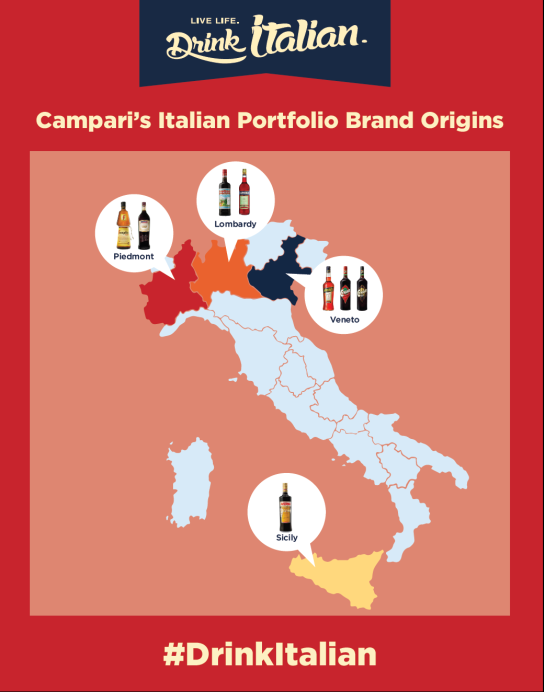 Currently, I have: Fernet Branca, Branca Menta, Amaro CioCiaro, Amaro Montenegro, and Cynar. Once we get back into winter-times, I’ll definitely re-stock Averna Amaro and Santa Maria Al Monte Amaro. Austria & Germany: From Austria, Rothmann & Winter Violette and Orchard Apricot are staple ingredients for some very famous classic cocktails. From Germany, the Haus of Berentzen makes incredible Liqueurs whose flavors have unbeatable clarity and usefulness. 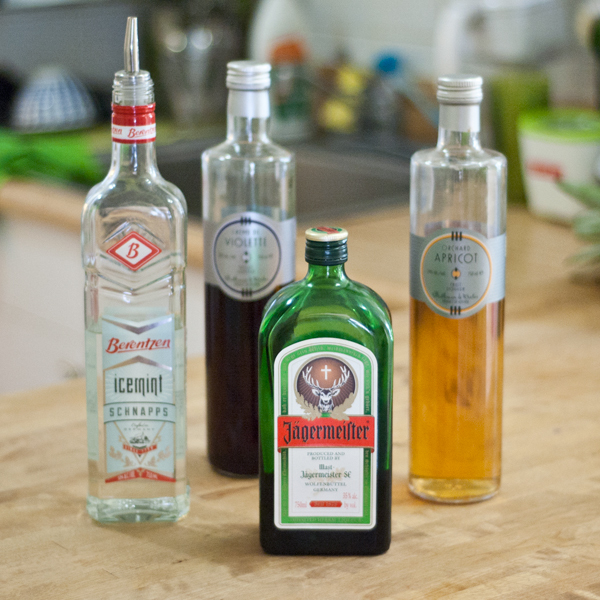 Jägermeister has recently changed it’s tune and is now pushing itself not just as something to take shots of, but as a VERY useful Cocktail ingredient. I absolutely love Jäger in drinks, and am glad for their new direction. The West Indies: St. Elizabeth Allspice Dram, Velvet Falernum, and Senior Blue Curaçao are absolutely essential for any good Home Tiki Bar and I use all three of these Liqueurs rather frequently. USA: hahahaha, y’all. 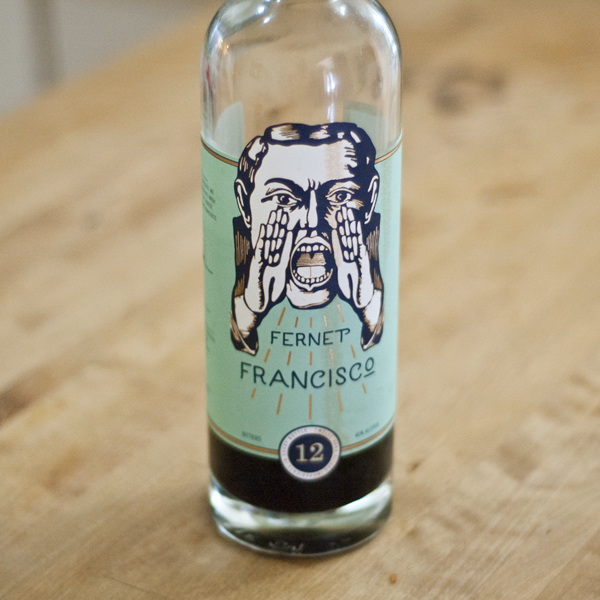 Fernet Francisco is the only Liqueur I currently have from the USA! In the past I’ve had St. George NOLA Coffee Liqueur (holy hell, it’s good! ), and a Maple Liqueur from Vermont. What would I like to have from the USA? 1. Anything from St. George Spirits (cause I luv them), especially the Spiced Pear and Raspberry Liqueurs. 2. Bittermen’s Amer Sauvage and Citron Sauvage, 3. Clear Creek Cherry and Cassis. Any suggestions? Vintage: Y’all, a lovely friend of mine gave these Vintage Liqueur bottles to me. (Thank you so much Ms Perl for these treasures!) 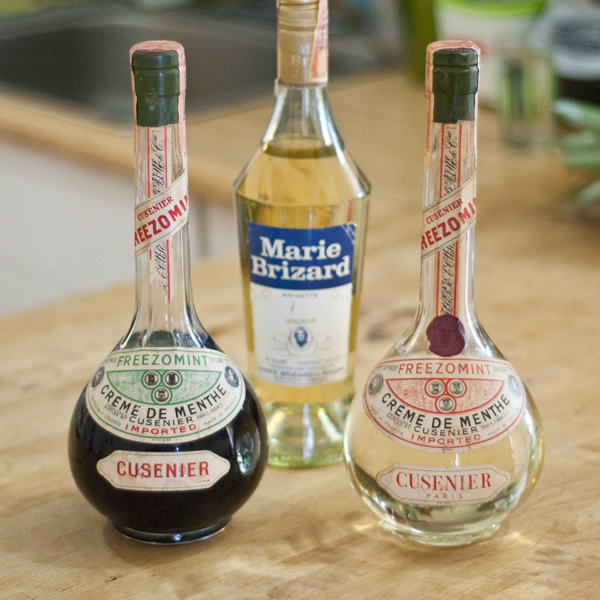 Two bottles of Cusenier Creme de Menthe from the 1950s and one bottle of Marie Brizard Anisette from the 1960s. Freez-O-Mint, such amazing packaging! People, when you design a new bottle, you need to look at these for inspiration! Cheers to Liqueurs and all the tasty Cocktails we put them in! ← Tour de Tiki at Gladys Caribbean Tonight!